Micah offers concert quality live music for your wedding ceremony, cocktail hour, and/or reception. He takes great pride in providing the same standard of music performance for a wedding as he does when soloing with a symphony in a concert hall or performing chamber music across the world. In addition to performing as a solo violinist for your wedding, Micah can also assemble a duo, trio, or string quartet comprised of top professional musicians he regularly works with in Charleston, Columbia, and all of South Carolina. It is important to know what a live musician could sound like on your wedding day, and especially how the musicians you decide to hire will sound. This is why Micah is happy to provide many video and audio clips on this page, all of which were recorded live at actual weddings. You should be completely convinced that the music will sound as beautiful as you imagined, and performed at the level you deserve. The five videos found below are of Micah performing live at wedding ceremonies and they include Solo Violin, Violin and Keyboard, Violin and Cello, String Trio, and String Quartet. They can be helpful to give you an idea of the differences between the various instrument combinations when you are deciding which one to have, and will also show you what Micah would actually sound like live at your wedding. Please visit the FAQ page. Below you will find a listing of the most commonly requested pieces of music for a wedding ceremony. There are certainly other works out there that could be performed for a wedding ceremony, so if you do not see something that you wanted to have performed at the ceremony just feel free to ask. A wide variety of contemporary popular songs are also available, and if Micah does not have what you are looking for it can even be arranged specifically for your wedding. Also, the category the piece is under (Canon in D is under Bridal Processional) is only a suggestion and most of the works can be performed at any time you like during the ceremony. If you click any of the selections found below that are underlined, it will play audio examples of Micah performing the work. It is important to mention that these were all recorded live at actual wedding ceremonies in South Carolina. Holst - Andante Maestoso from "The Planets"
If you have any questions, they might be answered on the FAQ Page. I didn't get a chance to tell you at my wedding how much I appreciated the music you and the other two musicians performed that day. You all did a wonderful job! Since I was a teenage girl, I knew I wanted a string trio to play at my wedding. Hearing your performance that day was truly a dream come true, and that meant so much to me. I can't say it enough: it was a tremendous relief to find you! After feeling a growing concern that had crested to panic, I wondered what (if any) music would be played at my wedding. I was so happy to discover your website. Your quick response to questions, your thoroughness, and professionalism from beginning to end were all excellent. I wanted you to know how grateful I am for your performance at the ceremony. Thank you for your part in making my wedding day so special! He was great and we would highly recommend! We were skeptical at first that we would find a good violinist online, but we decided to go with Micah after hearing his audio samples and seeing his website. He made everything so easy. He is far better than the average wedding violinist out there so if you can book him I would jump on it! Micah was great! He made everything very easy for us and the music was absolutely beautiful. We highly recommend! I am so thankful Micah was able to play for my wedding! It was outside and went exactly how I had pictured it. I did not get to hear much of the prelude music, but my family said it was amazing. Micah was so helpful when we were picking out our music, and he made the whole process easy. I am so glad I decided to go with Micah, he is a true professional! We are so thankful for the beautiful music that Micah provided for our wedding ceremony. We received several comments from our guests about the music and how it really made the event more magical. Thank you again and we wish you the best in your endeavors and career! Micah performed for our wedding ceremony. It was great to have the meeting with him so we could pick out the music after hearing him play through a bunch of songs. He made the entire process easy for us and he sounded great! I am so happy Micah and his quartet performed for my daughter's wedding in June! They were all extraordinary musicians and they sounded just like a recording! There were so many compliments from the guests, and we could not be any more pleased! I heard Micah at my friends wedding last summer in Sumter and knew right away that he would be great for my daughters wedding. He met with us and played more than 20 pieces for her and my son-in-law to choose for their ceremony. I chose the Bach-Gounod Meditation for the mothers, and it was absolutely beautiful. 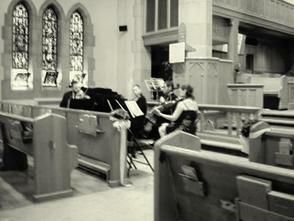 It was an overall great experience, and the music at the wedding was fantastic! I highly recommend to everyone that you should absolutely hire Micah Gangwer and his string quartet for any reason! Their professionalism and the sound of their music was just phenomenal and I am so happy they played for our wedding! Thanks Micah! Micah performed for my wedding and the music was truly wonderful. The way he played Canon in D when I walked down the isle was perfect, and we had so many complements from the guests about Micah and the music for weeks afterwards. Thank you again for all you did to make my wedding day so special!